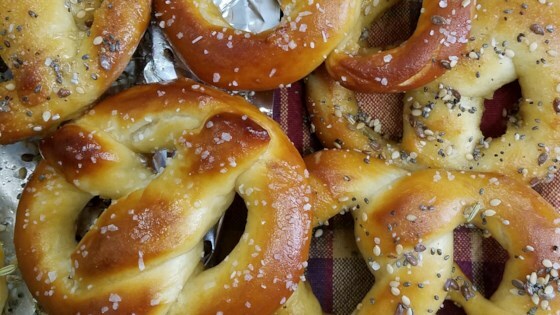 "After spending so much money on those Mall bought pretzels, I thought I'd try making some myself. So here's a recipe that has worked for me. These pretzels are a bit sweeter than other types and are buttery. These are great plain with a bit of pretzel salt or coated with cinnamon and sugar. Once finished, dip the hot pretzel in melted butter and coat with your favorite flavors. Enjoy!" In a large bowl, mix together flour, 1/2 cup sugar, and salt. Make a well in the center; add the oil and yeast mixture. Mix and form into a dough. If the mixture is dry, add one or two more tablespoons of water. Knead the dough until smooth, about 7 to 8 minutes. Lightly oil a large bowl, place the dough in the bowl, and turn to coat with oil. Cover with plastic wrap and let rise in a warm place until doubled in size, about 1 hour. These are so much better, and cheaper, than mall pretzels! Nice taste but WAY to much flour! Start w/ 3 & if you need more then add it but I did not need anymore than 3 cups!